According to recent reports, the feature has now trickled down into the current Beta channel, the update for which is rolling out now over on the Play Store. The dark mode flag has trickled down to Chrome Stable. It's available on version 74, which you can grab from the Play Store or APK Mirror. A new #enable-android-night-mode flag has been added to Chrome Canary, and when enabled, a dark mode toggle appears in the app's settings. Enabling dark mode also enables the split-toolbar 'Chrome Duet' interface, so it seems likely that dark mode will roll out alongside the Duet UI. This is still in the early stages of development, so much of the interface still hasn't been properly themed. There's plenty of black text on black backgrounds, some buttons are the wrong color, and the navigation bar is still white. There's also no option to automatically turn dark mode on and off. 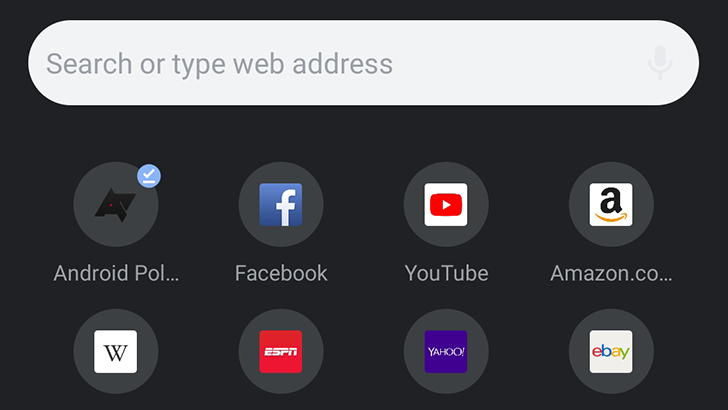 To try out dark mode, download the latest version of Chrome Canary from the Play Store and head to chrome://flags#enable-android-night-mode (paste that link into the address bar, tapping/clicking it won't work). Tap the highlighted dropdown menu, set it to 'Enabled,' and then restart the browser. You might need to close and open it again after that. The dark mode flag is now on Chrome Dev, and seems to be enabled by default for some people. It also no longer requires the Chrome Duet UI, so if you don't like the bottom toolbar, it's not needed for dark mode to work. According to recent reports, the feature has now trickled down into the current Beta channel, the update for which is rolling out now over on the Play Store. If you update to this latest Beta release, you should see the flags for dark mode available, should you go searching for them.